Tomatoes taste wonderfully sweet when they are home grown. Chose the right type of tomato, a nice pot, a sunny spot, and you're on your way to a plentiful supply of great tasting tomatoes all year round. And it's so easy! Here's a step by step turotial to grow tomatoes. Not only will you save a bucket of money, but you will have an organic, highly nutritional addition to your dinner table! Growing the Best Tasting Tomatoes Ever on Your Porch! When the great depression struck, most people were living in rural areas and so could grow quite a bit of their own food. These days, most people stay in cities and the only way to lower food costs is to grow food in your garden, or if you’re living in an apartment, grow food on your porch. One of the easiest food items to grow is tomatoes, and most people buy, at least, a few tomatoes each week, as they are very useful and tasty. However, there’s an even better reason to grow tomatoes on your porch, and that is the taste. Home grown tomatoes have a taste that has long been lost to storekeepers – with the exception of Heritage Tomatoes. So if you want to know how to grow tomatoes on your porch without breaking a sweat, read on! Home Depot Shows You How to Plant Tomatoes in a Container! Tomatoes will die if they are exposed to frost. So your porch needs to be protected from harsh elements and the soil needs to be somewhat warmer than cold! Actually, the warmer the soil, the better your tomatoes will grow, and the tastier they will be. If you own a greenhouse, they produce wonderful tomatoes. If not, you will need to select an area where there’s plenty of light as tomatoes love light. Tomatoes can have a pretty extensive root system so the more soil you provide for them to spread their roots, the better your plant. That said, there are many different types of containers from which you can grow tomatoes. 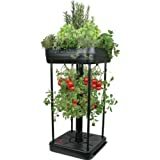 You can grow tomatoes in any type of container on the ground, or you can use a hanging pot to grow them. The larger the container, the greater spread the roots have, and that makes for a very large, tasty tomato, and lots of them! Growing tomatoes in a hanging basket requires a little more care and one has to select a smaller variety of tomato. When growing indeterminate tomatoes (they produce tomatoes one after the other instead of blossoming all at one time), it’s best to have a longish shaped container that stands up against a wall, or has sticks placed as these tomato plants are vines – not bushes. Tomatoes can be grown in many ways. They are very versatile. Growing a tomato plantin a hanging basket not only provides you with a tasty meal but makes a highly decorate statement! There are many different types of tomatoes. I’m sure you’ve heard of plum tomatoes, heritage tomatoes, cherry tomatoes, beafsteak tomatoes, and grape tomatoes. Did you know that there were about 7500 types of tomatoes? Commercially grown tomatoes which tend to be hybrids of two or three different types do not taste as delicious as heritage tomatoes. In addition, the tomatoes on a bush blossom simultaneously while tomatoes on a vine blossom at different times. As a home grower, one would probably want a crop that gives a fresh batch of tomatoes every few days, so the latter is probably the better choice. 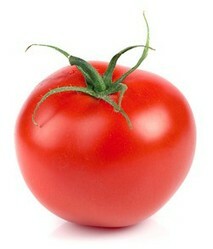 In addition, tomatoes are an annual plant which means that once they have blossomed (produced their fruit), they die. Currently, the most popular choice of tomatoes is the Heritage tomato. This is because the taste is out of this world and because they are indeterminate, which means that they produce new fruit every few days. They also don’t die once they produce, i.e. they are perennial rather than annual. How Much Work is it to Grow Tomatoes? There is a little bit of work involved in growing tomatoes. Firstly, you have to plant the seeds. Secondly, you have to check that the soil is moist all the time and water them when it is not. Thirdly, you have to ensure that they are getting sunlight, and if you can only ensure that it’s morning sun or afternoon sun, you will need to move the container around during the days. The more sunshine there is, the more tomato plants thrive! Also, if you’re growing from seed, you first need to germinate your tomato seeds, and once they have sprouted, you will replant them in a large container. Firstly, if you’re growing from seed, you can put a lot of seeds into a container, about an 1/8 inch deep and a few inches apart. You also need to use a soil that is specially prepared for seeding; this can be bought at a nursery. You will need to ensure that the soil is always moist and that the soil temperature is always warm. It will take about two months for the seeds to germinate, and it is at this point that they can be removed from their container and put into the large container. Select a sunny spot that will get sun during the day time, be it winter or summer. If you are living in a northern climate where it is too cold to grow tomatoes outdoors on the porch, then take them inside and get fluorescent grow light bulbs and keep them on so that the plants get lots of light. Tomatoes need lots of light. The best temperature to grow tomatoes is seventy degrees. Ensure that your container is wide and deep and that you can keep the soil in a constant state of moisture. So there should be good drainage. Tomatoes always need a good deal of water so if you choose to grow two or more tomatoes in one container, you will need to water two or three times more than you would if you only had one tomato plant in a container. Put well fertilized soil into the container. Most potting soil does not contain fertilizers, so if it doesn’t, then you need to feed the soil in which your tomatoes are growing with a weekly dose of fertilizer. It is better if the fertilizer is a slow release fertilizer and, of course, there are fertilizers that are used specifically for tomatoes, so it’s best to invest in these. The trick to having successful tomato plants is to permit them to have lots of moisture, heat, sunlight, and a deep root system. So when you plant the seedlings that have sprouted, put the first two or three levels of leaves underneath the soil, leaving the rest above ground. Plant about eighteen inches apart if you don’t give each tomato plant their own pot. Water them with warm water about ten or fifteen minutes after you have planted them. This helps them to settle. Keep the soil moist at all times and ensure that they have strong light. Harvest them when they are ready as the more you harvest, they more they produce more fruit. Heirloom Tomato Seeds Grow the Tastiest Tomatoes Available. You'll Never Regret Growing the Best Tasting Tomatoes Ever! Growing tomatoes on your porch can be the beginning of something grand. As you learn about growing plants, it becomes addictive. Ask any gardener! However, more than that, the difference in taste is so immense that soon you will be growing cucumbers, lettuce and spinach, all of which can be grown quite successfully on your porch! Excellent guide and tutorial. And the best part is that it requires a minimum of space. Nice article! Don't you find that the home grown one's taste much nicer than the shop bought ones??? I'm planting lots of stuff on my back porch this year, I'm really growing to love container growing. I have a hanging basket packed with yellow grape tomatoes, it's a first for me too. Great article, I love tomatoes. I'm still picking tomatoes from my garden (my deck is too small to have a pot of them). There is just nothing like a home grown tomato! It's the number one thing I always grow in summer. I don't start them from seeds, but I have had "volunteers" spring up which is always fun, since I'm unsure of what I'll get. Hi Sunforged. Nice to see you here. (Sophia Angelique). Can you please tell me which tomatoes you are talking about because there are so many different varieties. I would like to add what you have said. :) Hope you don't mind. In my experience, tomato seeds only take 5 to 10 days to germinate, and perhaps another week to develop true leaves and be ready for transplant. Of course, this could vary greatly by species and condition. But, 2 months is quite a bit longer than I have ever had to wait. Even though I do have a backyard, I'm not much of a gardener. However, in light of the questionable quality of commercially produced food, I increasingly feel the need to grow my own vegetables for my family. I think that container gardening might actually be something even a green-thumb-challenged person like me could do successfully. Thanks for these great tips and Welcome to Wizzley!